AidLink is a secure online system that gives you 24-hour access to your SDSU financial aid records and your SDSU scholarship application(s). We use the email address you provided on your SDSU WebPortal account. Don't wait in line. Check online! Please check your AidLink account before contacting us with a question. SDSU scholarship application: If you do not already have an AidLink account created by completing your FAFSA or California Dream Act Application, we will create an account for you when you apply for an SDSU scholarship online. Your AidLink account is available immediately after you submit at least one SDSU scholarship application online. You may access your AidLink account at any time to monitor your scholarship application status and awards. How do I use AidLink? If you haven't used AidLink before, watch this brief video tutorial, How to Use AidLink. Here are some of the ways you can use AidLink. View your financial aid and scholarship information, instructions, and status. Complete and submit some documents online. Download and print documents that you need to sign and submit to us. It's easy! 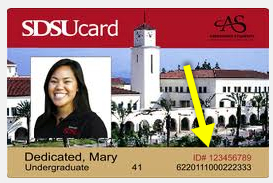 You can either Log in using your SDSUid or your SDSU Red ID (your student identification number) and the applicable password. Your SDSUid (e.g. jsmith@sdsu.edu) is the account used to securely access many IT services on campus. Your Red ID is used to access the SDSU WebPortal to check your admission status, register for classes, check your grades, etc. If the social security number you used on your FAFSA or the name and date of birth you used on your California Dream Act application does not exactly match what you used on your application for admission to the university, we will not be able to display your financial aid information on Aidlink, nor will we know when you have been admitted to the university. If this describes your situation, please contact the Office of Financial Aid and Scholarships for help. Watch this 4-minute video describing How to Use AidLink.